June 2, 2017 April 13, 2019 - The 'Noms. 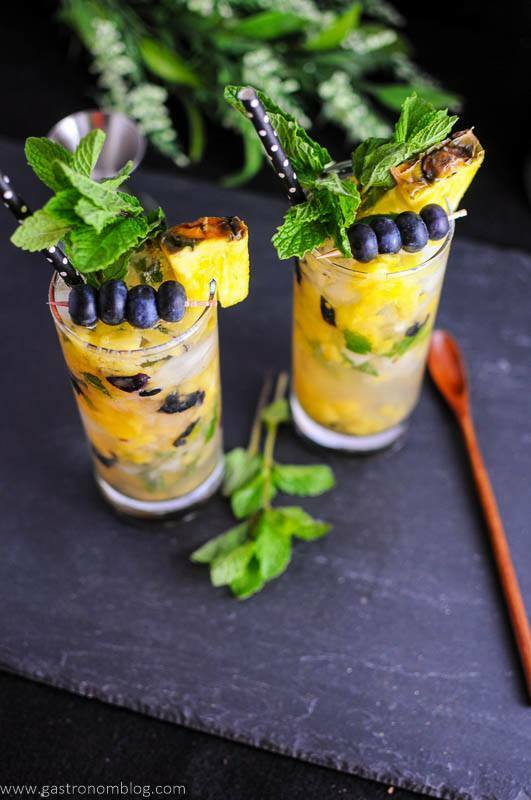 A fruity blueberry pineapple mojito perfect for hot weather! Blueberry and pineapple, mint and rum! With warm weather finally making its appearance here in Omaha, that means it is almost pool season, and in our house that means we have to have some sort of tasty beverage to refresh ourselves with while lounging by the pool. What better drink to sip by the pool than something tall and tropical? 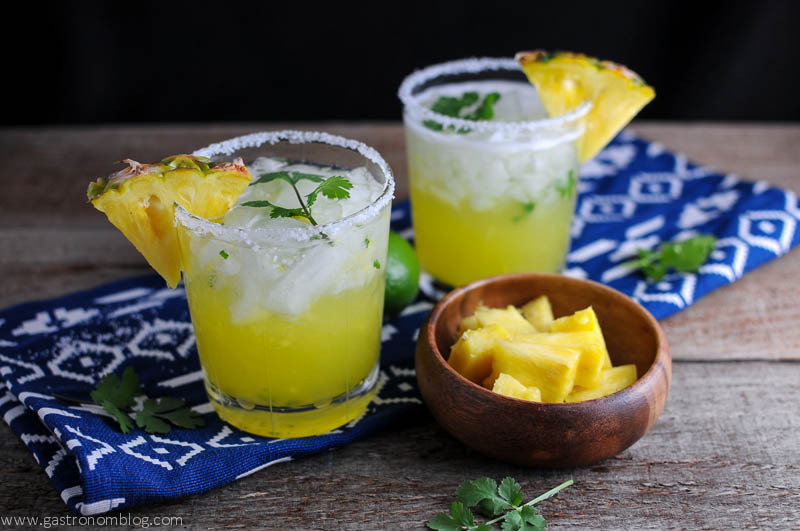 Why not a pineapple cocktail? We had a little fresh pineapple in the house and fresh spring mint from the farmer’s market just begging to be used! So, we thought why not a Blueberry Pineapple Mojito? What is the History of the Mojito? The mojito is one of those drinks that definitely is tropical, with origins tracing back to the bars of Havana, Cuba. It was reputed to be one of the drinks that kept Earnest Hemingway well hydrated! Traditionally made with rum, mint, fresh lime juice and sugar. The Mojito is a delicious combination of tart citrus, cool mint and sweet rum and is a perfect way to cool down on a hot day! What Kind of Mojito To Make? While we could just stay with the classic mojito, we wanted to make the drink feel a little more tropical, too. What better than adding a little fresh pineapple? We had a delicious fresh pineapple and some tart blueberries, so we muddled the blueberries, pineapple and the mint first. This created a sweet, fruity tropical mix then added a simple white rum to create a totally different mojito. 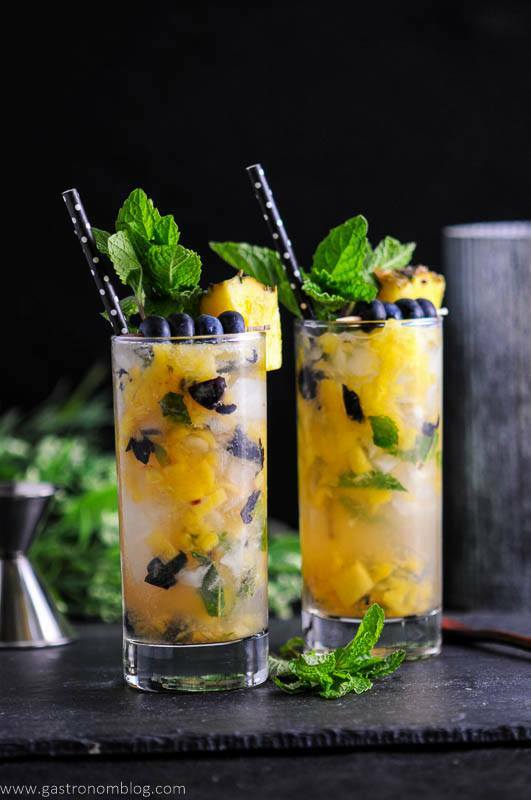 What Ingredients are Needed for the Blueberry Pineapple Mojito? The pineapple added a sweet tart topical flavor to the cocktail while the blueberry brought a nice fruity burst. This smooths out the rough edge of the rum and makes this a great sipper for the pool! 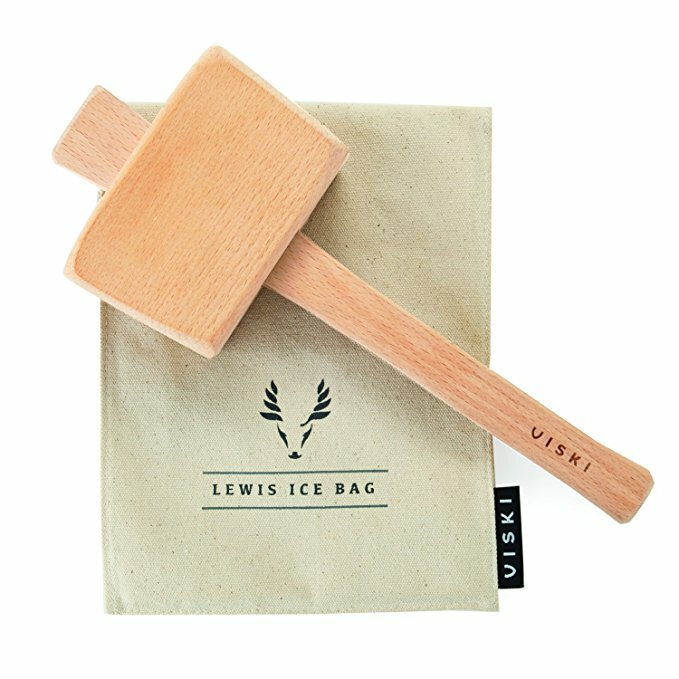 If You Are Looking for More Rum Cocktails, Try These! Speaking of new twists on things, we have started doing something new and totally different for us, cooking events! 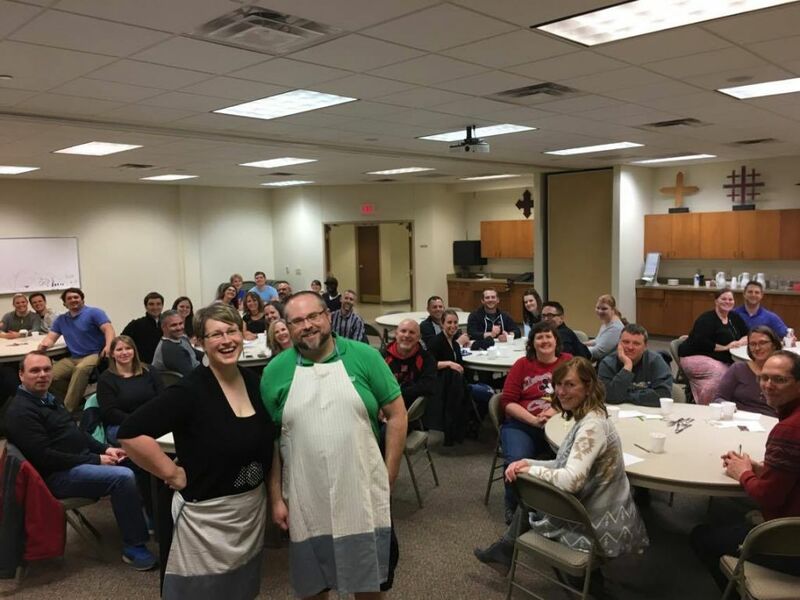 We recently held the first event at our church. 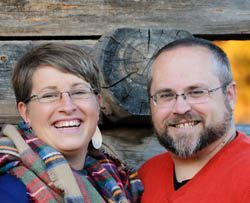 There were 20 couples in an interactive dining experience. First, we started out with some appetizers while folks got settled and found their seats. Then we served some nice crostini (made with mascarpone, cream cheese and chopped chives, fresh strawberries and honey) and Italian bites (pepperoni, mozzarella and olives) to get folks started. For the interactive part, we had folks make their own pizzas, and salads, along with their choice of vinaigrette. 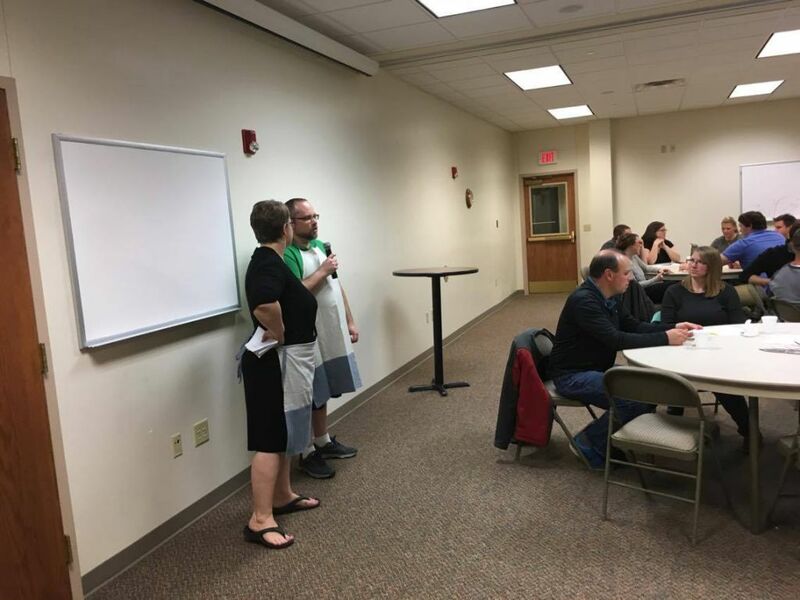 After everyone finished up with the main course, we got to what people said was the highlight of the evening, the cooking competition! 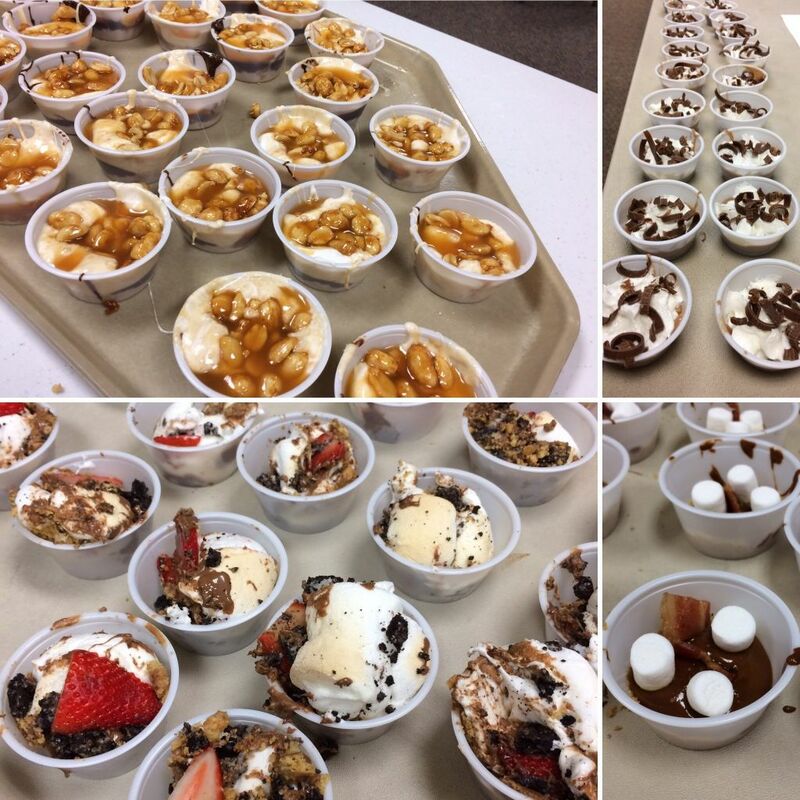 We challenged the attendees to come up with a small dessert for everyone. The only option was they had to stay with the theme of “smores”. Then each dessert could only use chocolate, graham crackers and marshmallow in a 30 minute time frame! We had some amazing creations, like a smores casserole, a smores popcorn ball and even a marshmallow chocolate mousse with shaved chocolate! It was a great night and we hope to do some more soon! 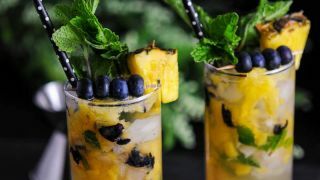 A fruity and tropical mojito with blueberries and pineapple and of course, mint! 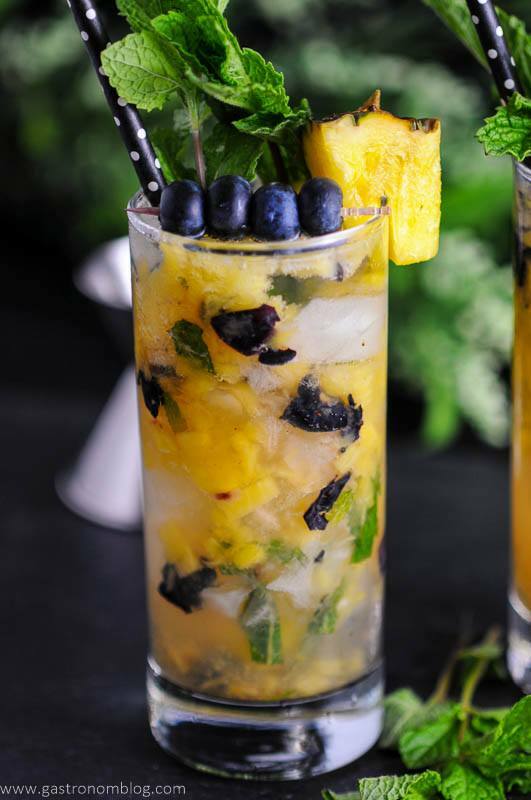 Add pineapple chunks, blueberries, mint syrup and mint leaves into two highball glasses. Muddle until pineapple chunks, blueberries and mint are broken down. Add in crushed ice, lime juice and rum. Garnish with fresh blueberries and mint leaves. 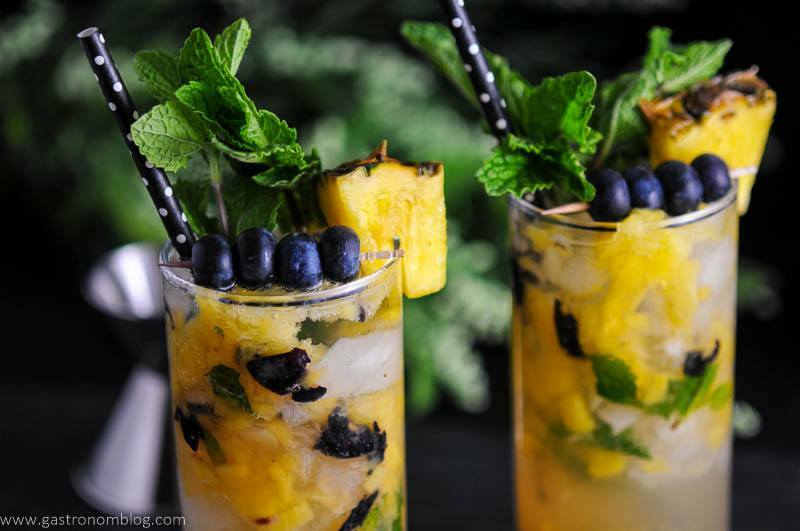 PIN THIS BLUEBERRY PINEAPPLE MOJITO RECIPE FOR LATER! 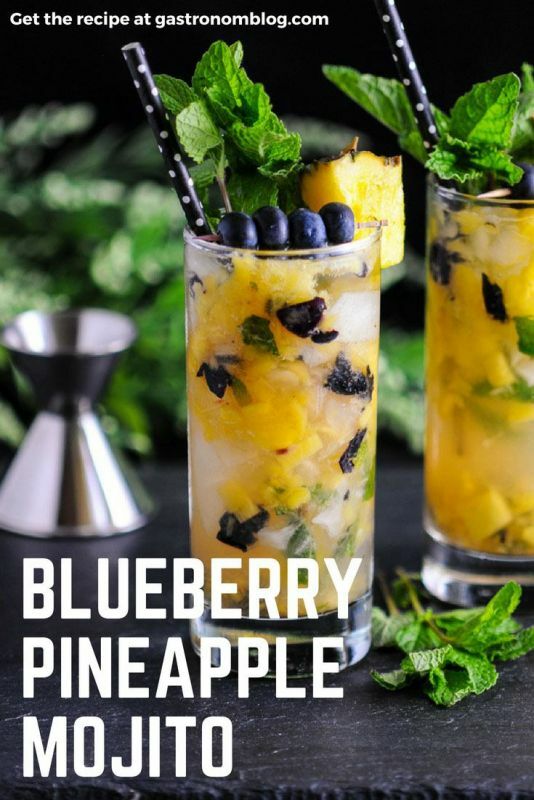 I absolutely love pineapples and blueberries so I would totally try this drink! It’s looks amazing! 🙂 It also sounds great for an event as well. It’s a great combo! Hope you try it out! Cheers! This cocktail sounds (and looks!) amazing! Definitely going to try it out this weekend! Thanks so much! Hope you enjoy, cheers! 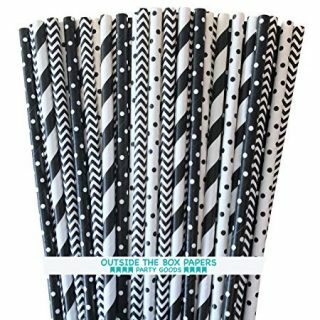 These sound so tropical and tasty! Definitely making a batch for some poolside lounging this weekend – they look so refreshing! Thank you! They would be perfect for a lazy day, enjoy! These look incredible! I definitely know what I’m making for my next brunch party. Thanks so much! Hope you try it! Cheers! I’ll definitely be trying this!! It looks perfect for summer! Looks like a refreshing drink for a summer day! These sound amazing!!! All things I love, I must try it! Thank you! It’s a great combo, cheers! Yum!! This combo sounds delicious! A perfect summer drink! Do you have a recipe for the mint simple syrup? Yes! 1/2 cup water, 1/2 cup sugar, 1/2 cup mint leaves. Combine sugar and water over medium high heat, and bring to a boil. Take off heat, add mint leaves and steep for 10-15 minutes. Strain, and store in the refrigerator. Me too! Just makes it seem so fresh and summery! Cheers to you! This looks like an amazingly fresh and delicious drink! Thanks so much! This one was pretty tasty! This mojito sounds absolutely delicious! I am a huuuuuge mojito fan but the pineapple and blueberry make it even better! I cannot wait to try it this summer! Thank you! It’s pretty tasty if I do say so! Cheers! This looks so delicious! Love the color contrast. Definitely one to try this summer!! I love how this mojito is packed with fruit and has a mint simple syrup! I usually just muddle mint but I bet that simple syrup makes it taste even better. The cooking event sounds like a lot of fun! My Book Club Group loved this Cocktail! 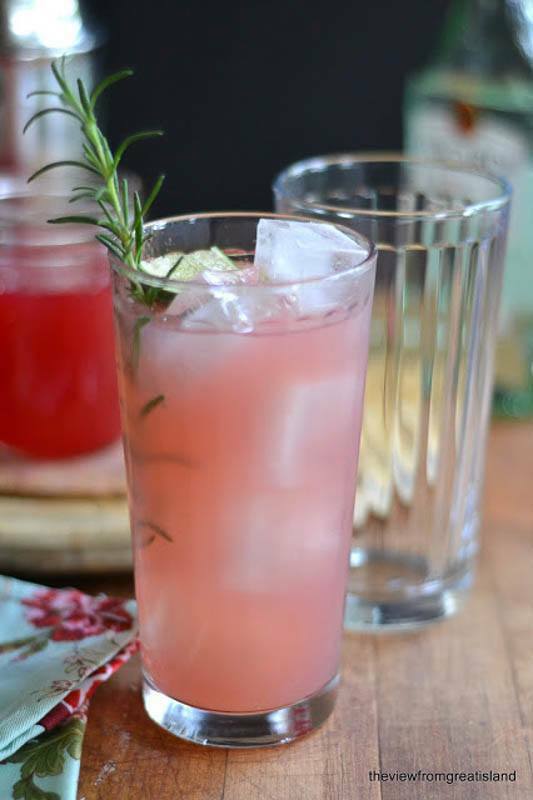 Our group met on a hot summer evening, and I made this drink. So refreshing…the fresh pineapple and mint were so refreshing. I had some long cocktail spoons and we all enjoyed fishing out the blueberries and pineapple puree. Needless to say, everyone had seconds. Thanks for the feedback! Love that everyone enjoyed it! Cheers! I love run cocktail. Your recipe should be wonderful. I’m having a party and it’s going to be the news! Thanks so much! Hope you enjoy it, cheers!